The team at Dragon City is always looking for new suggestions from our players to incorporate into the game. This time around, they’ve been working on bringing back an old favorite: The Reward Calendar is finally coming to mobile versions of Dragon City! Each new day, as you log in to take care of your dragons, you will get a free reward to help you along the way. It’s a simple concept and most of you will already be familiar with it. You will also have a calendar to help track which rewards you’ve claimed and which ones are coming up that month. Consider yourself an active player? Does Dragon City often join you in your morning coffee? We want to reward our most engaged players with a little extra. Apart from the regular calendar, we will also be offering Streak Bonuses. Set yourself apart from the crowd and get extra rewards by maintaining log-in streaks. On the side of the regular calendar, you will see your current Streak Bonus calendar. There you will be able to see your current streak and the total number of days you need to maintain in order to claim the final reward. Just be careful, miss a day and you’ll have to start all over again! As the new Reward Calendar will fill a similar role to those calendars already available in the Facebook version of the game, we will be removing the Welcome Back (only available to players after long periods of absence) and the Daily Help calendar, which were only available to certain players. Overall, we hope that this will help streamline things a bit more and bring a much-requested feature to our most mobile Dragon Masters. The new Calendar will be available in the game from April 11th, 2019 on. It’s that time of the year again, April arrives and we get ready to celebrate Dragon City’s Anniversary with all our Dragon Masters. This time around, it’s extra special for us, as you, the community, have been directly involved in helping us choose which Dragons will be included in this year’s Anniversary Event. Each Dragon you voted on will be included as a reward in one of our several activities that will be available from April 4th until April 11th, 2019. Anniversary Calendar: Log in every day to receive a free gift, including free Gems, dragon skins, tokens, and Food. Complete the full calendar to receive an exclusive Anniversary Decoration! Ghost Dragon: available in the Freebies Island from April 5th until April 8th. Salamander Dragon: available as a reward in a Temporary Quest from April 4th until April 8th. Anniversary Grid Island: The big event where you be able to claim the WilderBeast Dragon, Cake Dragon, and the exclusive anniversary Baker Dragon! Sarcophagus Dragon: available as a Collection Reward. We’d like to thank our Dragon Masters once again, for voting in our poll and making this event even more special and we hope you’ll enjoy the event and the community-chosen rewards we included! Do you know what happened in April? That’s right! Dragon City turned 7! Our Anniversary Event is almost here, and will include dragons as rewards that were voted on by YOU, the community! We’ll also have fan favorites returning, like our Easter event, a new Heroic Race, and one of the cutest puzzle islands you’ll ever see. So, let’s jump in and have a look, shall we? This month we will also be offering other special Temporary Quests, new Skins, and special Breeding Events! For the special breeding combinations, be sure to check the game Breeding Event Island or our community sites! Like every year, we’re really looking forward to our Anniversary events and are very excited to be able to include dragons chosen by you, the players. Make sure to share your thoughts with us! Habitat space is a precious commodity in Dragon City. As your collection grows, so does your need for more habitats to place your Dragons in. However, haven’t you noticed that a lot of the time, your Dragons aren’t even at their habitat? While they’re off training, rebuilding towers, or involved in dangerous missions, that precious space sits there unused… Well, not for long! 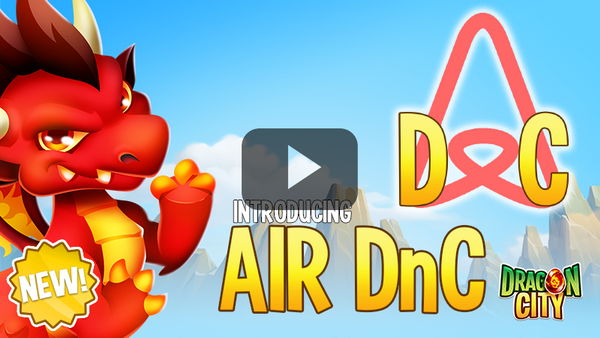 Introducing a brand new service for Dragons on the move: Air DnC! Now your dragons will be able to rent out their space to other dragons in need! Your Dragons will now have access to a new in-game app where they can post when their habitat will be available for other dragons before going on an extended leave. Dragons waiting in your hatchery will receive a notification in their app and be quickly informed if a habitat for their element becomes available. Dragons managing their own bookings, so it’s all automatic. Increased Gold / min thanks to the extra rent income. If Dragons leave positive reviews you will receive a Gold / min bonus. Decorations will increase the chance of positive reviews. No extra purchases necessary as Dragons already own a phone to install the app in. Then click on the link below to see our demo in action! First of all, we would like to thank you for the feedback you shared with us, especially in the forum! Thanks to your feedback and suggestions, the team has been working on some instant improvements that will be in the next Dragon Rescue event. It is also important to mention that the team will continue working on further improvements and balancing. We are still considering your feedback and suggestions, and a lot of it will require further development time, so rest assured, we will continue polishing the event further in the future. The cooldown times have been slightly reduced in all paths. Food rewards have been increased in all paths. We will have 5 different KEYS. -> Available from the beginning of the event! Quests: They will start at the same time as the Dragon Rescue event and will last for the entire duration. Keys will be available as a reward. A Temporary path in the Abyssal Island Event will start at the same time as the Dragon Rescue event and you will be able to obtain keys along with Food. The Hard Path requires keys that will be available in the easy and medium paths. Keys will be available for purchase in the Shop via offer packs. During the first 2 days of the event, Video Ads will offer Gold, Food, and keys. That’s all for now, Dragon Masters! Get ALL your dragons ready for the rescue mission!! See you back on the islands. As you probably noticed in-game (thanks to that really cool MrBeast Dragon) a few weeks back we did a collaboration with MrBeast both in-game and on his YouTube channel. He took the spirit of Christmas a step further by dedicating $100,000 to help supply several homeless centres during the holiday season. He is well known for his giveaways in the channel, but this time around, as he puts it in his video, instead of helping just one person, he wanted to help as many people as possible. So, with a little help from his friends, they got in touch with several shelters, asked what supplies they needed (or even repairs in some cases) and went the extra mile of buying the supplies, delivering them and helping them unpack and store them. We have no words to express how proud this video has made the entire team and wanted to share it with all of you. After all, the holidays might be over, but good deeds live forever. Thank you MrBeast and we hope this video inspires you all to spread the love and do some good deeds in your own area. Maybe make it one of you new year resolutions? You can also join the Dragon City team and Community fundraising effort for War Child, where we’re trying to raise funds to help children affected by conflicts all over the world. Click here to check out his video, it’s well worth a watch. Just wanted to let you know that business is back to normal now. Hope you all had a wonderful holiday and we hope the break didn't cause you any inconveniences. Happy New Year Dragon Masters!